I was the guest of my friend and fellow MTC member Tony Rouse and his wife Lisa. They were kind enough to offer there hospitality to me to save the long drive down from Zebulon on race day or finding a motel. After breakfast and coffee, we made the drive down to the hamlet of Hamlet NC. The race is held in conjuction with the annual Seaboard Festival that celebrates the towns history and relationship with the railroad. Hamlet was at a crossroads of two major tracks of the Seaboard Airline Railroad and also the location of a major yard and service facilities. Over the years many mergers and aquisitions later , Seaboard is now a part of the massive CSX Transportation but the town is still a railroad town. The old depot is a historic site and a museum now but the area is still serviced by Amtrak. The race is the 3rd in a series of Mangum Track Club events and is required running if one is interested in getting bonus points in the quest for the Mangum Cup. At the present time Tony and I are the two points leaders and barring a major catastrophy, one of us will be this years winner. Since I have become mostly an ultrarunner the past several years I seldom run these shorter road races. One reason is because to run them fast you have to hurt just about every step of the way. Especially if you don't train for it. 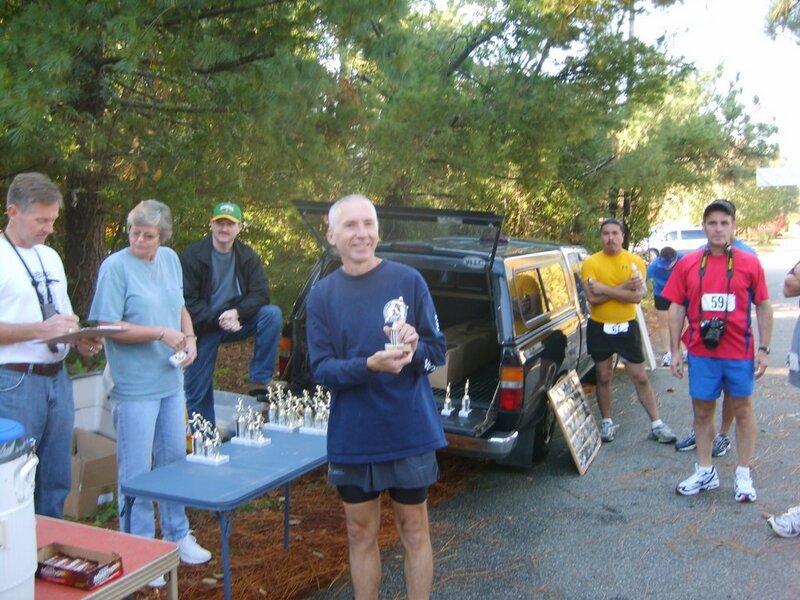 Before I begin my quest to qualify for Boston, I had not done any speedwork in about 20 years. And since I ran my qualiifer this past Feb. I hadn't done anymore. That became painfully evident between miles 3 and 4. I had been running quite well up to that point but I could feel the bear crawling onto my shoulders. About that time I heard footsteps behind me and I was 99% sure without looking back that it was Tony. He soon passed me and although I recovered and ran the last mile back at exactly my average pace for the whole run, I never was able to close the gap. But hey, that's OK. He's not in my age-group and there are no bonus points for finishing in front of me! Overall, I was very happy with my race. I was 9th overall and 2nd in the 50-59 age-group. Getting older doesn't make competing any easier. Mark Long and his volunteers and the town did a great job as usual allowing us the opportunity to have some fun . It was nice to hang around for awhile with my fellow MTC's. If you are interested in a well organized race that is a bargain compared to most races, come down to the Sandhills next Oct. Here is a link to a few photos I took at the finish .